In stock -This product will ship today if ordered within the next 14 hours and 58 minutes. Java citronella is at least twice as strong as the ordinary common variety of citronella; possibly because insects have been unable to build up any tolerance because of its rarity. In aromatherapy citronella oil is said to possess activating and warming qualities both physically and mentally. Diluted in a base oil such as almond, citronella oil applied to the skin produces a mild sensation of warmth – which relieves painful muscles and joints. Mentally, the aroma of citronella oil may help with nervous fatigue due to its clarifying properties. It can also ease pressure of migraines and headaches. Citronella oil blends well with cedarwood, orange, geranium, lemon and bergamot. Citronella oil has minimal or no risk to wildlife and environment due to its toxic levels being low and its use being limited. Therefore, it can be used around the home with no expected adverse effects. Indeed, some people make there own cleaning preparations with it! Dilute at least 1 to 6 before applying to skin. Can be used in any oil diffusers or burners. Add to base oil for massage or bathing. Can be added to any cream, shampoo, etc. 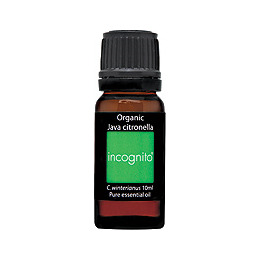 Top up incognito or any other natural insect repellent for greater efficacy. Add a few drops to your clothes or luggage to keep them smelling fresh and unwanted small visitors away. Pure organic essential oil; always carry out a patch test when diluting and dilute further if any irritation occurs. Stop using if irritation continues. Below are reviews of incognito Organic Java Citronella Oil - Insect Repellent - 10ml by bodykind customers. If you have tried this product we'd love to hear what you think so please leave a review. 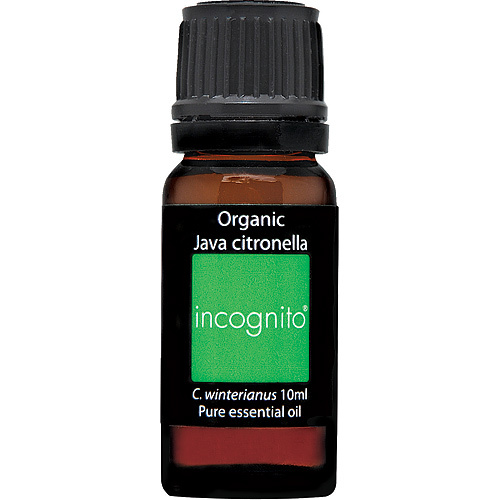 incognito Organic Java Citronella Oil is at least twice as strong as the ordinary common variety of citronella; possibly because insects have been unable to build up any tolerance because of its rarity.